Dame Susan Devoy speaks about hate speech at Holocaust Remembrance Day. Frequently asked questions for students about the Holocaust from New Zealand’s Holocaust centre. New Zealand’s welcome to refugees, yesterday and today. The man who brought 1100 Nazi fugitives to trial. An article about the large number of German Jews sent to camps in France. The former Warsaw Ghetto is to be preserved. The experiences of French women deported to Nazi concentration camps. An article about the extermination of Jews in the Netherlands. James McQueen describes life as a prisoner of war and interrogation by the Gestapo. A composer discusses the choral piece Annelies. The capture of Heinrich Himmler by the Black Watch. Analysis and evaluation of the Nuremberg Trials. A newspaper article on 800 Jews killed in poison gas tests. Reinhold Hanning was an Auschwitz SS guard. Oppression of the Swedish and Dutch Jews by Germany. Historiographical and bibliographical analysis of the Einsatzgruppen (death squads). Persecution of the Jews according to the Nuremberg Race Laws. German troops at the annual Nazi Congress at Nuremberg. Baron Hirsch’s scheme for Jewish colony in South America. The immigration of Jews to New Zealand. British Government considers settlement of Jewish refugees in the Pacific Islands. 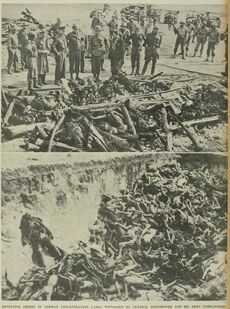 German concentration camps crime witnessed by General Eisenhower. 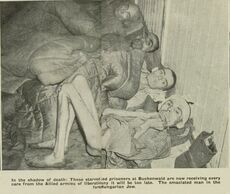 Bodies lying in the Belsen concentration camp. 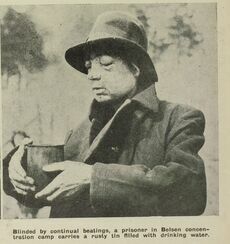 A prisoner in Belsen concentration camp holding a rusty tin. Edward Mroczek wrote this letter while imprisoned at Flossenbürg concentration camp. On January 271945, the Soviet Red Army liberated the concentration camp of Auschwitz-Birkenau. This day is now celebrated internationally as the Anniversary of the Liberation of Auschwitz-Birkenau. A thematic and chronological history of the Holocaust. Hitler’s political manifesto that formed the basis for Germany’s Third Reich. 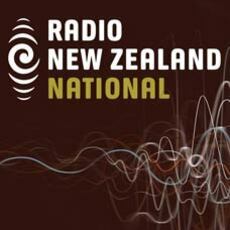 New Zealand holocaust survivor Lotte Weiss tells her story. Contents of the Nuremberg Trials collection. A summary of the life of Anne Frank. I was 9. I wanted togo on a train trip. The stories of Bob and Freda Narev, and Fred Silberstein, child survivors of the Holocaust. Primary source collection of images, reports, cables, letters etc. on the Holocaust. Oral history testimonies from Jews who came to live in Britain during or after WWII. The man who refused to give a Nazi salute. Jewish refugees interned on Somes Island during World War II with Germans. Richard Evans: The historian who took on a Holocaust-denier. A website dedicated to remembering the Holocaust and genocide. A graphic novel that reveals the horrors of the Holocaust on a personal level. How artists responded to the Holocaust. The decisions and actions leading up to the 'Final Solution'. Use of art to teach about the Holocaust. Why remembering the Holocaust matters more than ever. Documents, letters, telegrams, drawings and photo albums of the Totenberg family before and during the Holocaust. Poems that mirror the pain of the Holocaust. Third Symphony, Symphony of Sorrowful Songs by Górecki commemorates the Holocaust and became a worldwide success. Twenty eight educational videos on related topics about the Holocaust. This virtual exhibit tells the stories of Jewish orphans who immigrated to Canada. American doctor's account of Dachau's SS guards being shot dead because they 'so had it coming'. 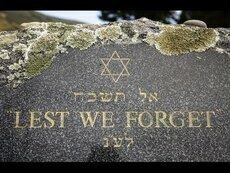 Remember.org helps teachers and students find Holocaust resources on the internet. The 70th anniversary of the liberation of Auschwitz. Resources on the Holocaust from the American-Israeli cooperative enterprise. Portrait of 3 women who dared to resist the Nazis. Universal lessons of the Holocaust in today's world. Examine thousands of historical documents on the Nuremberg trials. A chapter from the book Holocaust and Human Behaviouron the uprising in Warsaw. The 5 million non-Jewish people killed by the Nazis. Nazi death squad's shocking secrets. Nazi death squad's shocking secrets revealed in buried note. Resources about the David Irving v. Penguin Books Ltd. and Deborah Lipstadt trial. Resources on the Holocaust for students and teachers. Links to Holocaust museums around the world. An archive of videos of Holocaust testimonies. Photographs, documents, art, music, movies, and literature about the Holocaust. Hitler’s henchman - Heinrich Himmler was known as 'The Executioner. Diana Wichtel recounts travelling to Poland, where her father, Benjamin Wichtel, lived through the Holocaust. 10 Holocaust survivors tell their stories. The meaning of pogrom; when it started and how it affected the Jews. Sydney’s Moriah College is collecting 1.5 million buttons in memory of the 1.5 million children who perished in the Holocaust. British forces liberated Bergen-Belsen in April 1945. The history and meaning of the word, Holocaust. Haunting pictures of Holocaust victim brought to life with colour. A British soldier stands beside a former commandant of the Dachau concentration camp. Germany invaded Poland in 1939. Hitler, the leader of the Nazi party, arrives in Nuremberg to go to a congress attended by 250,000 Nazis. Controlled by Heinrich Himmler, the Gestapo was Nazi Germany’s feared secret state police force. Joseph Goebbels was appointed as minister of propaganda by the German Third Reich under Adolf Hitler. This article is from 1914, during World War I.
Nazi officials implemented the Jewish badge (an identifying badge to mark Jews) between 1939 and 1945. Provides a range of Holocaust resources for teachers and students. Also features the Children’s Holocaust Memorial and its relevance to the New Zealand Curriculum. Holocaust is the name given to the systematic persecution and extermination of over six million Jews and others in Europe during the World War Two.